The fall flap with bead borders and enclosed pigeon holes, miniature drawer and leather writing surface. Fitted three graduated drawers below with nice handles, dovetailed jointing and solid interiors. (In relatively good condition, wood veneer good but could use a little restoration in a couple of places. Central fold down writing leaf material on writing surface). On each side glass display area with 3 glass shelves in each. A uto Pull out b ars for the writing s lope when pulled down. The item is in great condition with minor marks consistent with age and use. 92 cm Wide X 50 cm Deep X 200 cm High. IN FITTING WITH THE ‘SHABBY CHIC’ STYLE THERE MAY BE IMPERFECTIONS SUCH AS SCRAPES, SCRATCHES & WORN LOOKING AREAS. THESE MAY BE ACCIDENTAL OR DELIBERATE BUT THESE ALL ADD TO THE EFFECT OF THE ‘SHABBY CHIC’ LOOK. W:76cm x H:103.5cm x D:47cm. 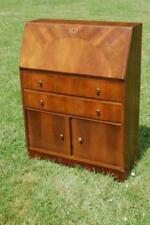 Rare design Art Deco period walnut and mahogany bureau. Writing Surface Height: 72.8 cm. The angled fall flap enclosed cubby holes and miniature drawer. Fitted a long drawers below above cupboard doors enclosed shelving. 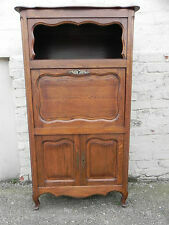 Dating from the 1930's this this lovely little cabinet is fitted with double glazed doors. over a concave fall flap writing desk, fitted with a single frieze drawer, and raised on. Thi s Item Is Available To View At Our Ipplepen Warehouse. Mid century 1960's Walnut Veneer Bureau. A lovely small size to fit most spaces, the top opens revealing storage pigeon holes. Double doors with working lock and key, Three good size drawers. Lovely piece of furniture in an Antique style. Made we believe using. The writing leaf has working lock & key too, several pigeon holes and what looks to. This one does not have lighting and the fitted interior does not really allow it. Makers label inside reads Burolite and fitted with Penrest. Pleasing shape with shaped base plinth to front a nice touch. The top section with two glazed doors opening to adjustable shelves. Below there are four long graduated drawers, good condition. 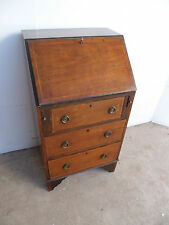 An unusual slim Arts and Crafts walnut fitted bureau, with brass swivel candelabra branch. Circa 1900. The interior is fitted with a letter holder above an ink well which is hinged to access, and a removable pen holder. The fall has warped with age, therefore it does not close perfectly flush at the top right hand corner. Simply scroll down the page to view them. It has a dental frieze under the cornice & two doors below with adjustable shelves. 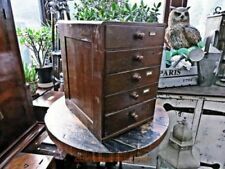 There are four drawers with original brass handles & locks. Wales & Scotland may be a bit more. However, you will be responsible for the cost of transport both ways. It has beautiful ball feet and retro handles. Walnut veneer in fair condition with a few scratches and marks. One handle needs repair. W: 4ccm; H: 101cm; D: 42cm.